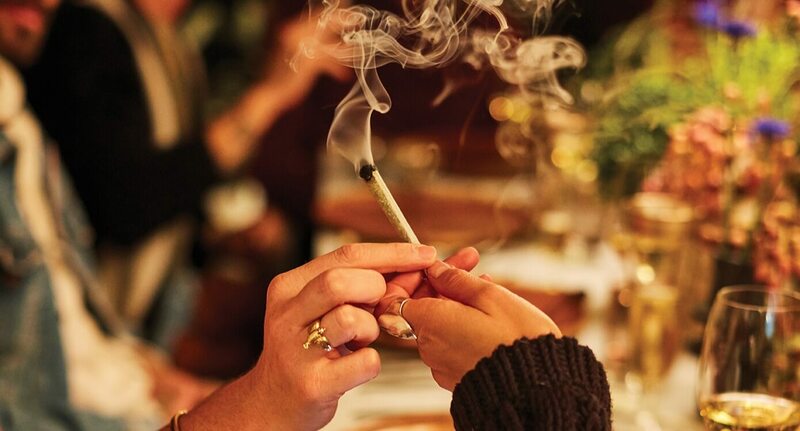 On a clear October night, Chelsea Hansford, one-half of the Los Angeles– based brand Simon Miller, is calmly overseeing the transformation of her Laurel Canyon home for an intimate evening of local flowers, food, and cannabis pairings with eight of her friends and colleagues. In a black cable-knit sweater, flared black patent-leather pants, and the label’s new “blackout platforms” in green, the designer’s signature style (Palm Springs meets American Modernism) mirrors the 1963 indoor-outdoor retreat she shares with husband Grégoire Gamba, who designs the label’s handbags. Just like Simon Miller, which she directs and owns with Daniel Corrigan, Hansford and Gamba’s home is defined by bright bursts of color: an outdoor orange Togo sofa, a cobalt-blue Kvadrat-upholstered couch, even a plush limegreen dog bed for their English Bulldog-Boxer, Marcel. Together, these bright accents set off the house’s warm wood ceilings, black oil paintings by Gamba’s grandmother, and surrounding white birch trees. Everywhere, the designer’s penchant to “push boundaries,” as evidenced by an expanding line of womenswear, bags, shoes, and accessories, including acrylic-handled “bonsai bags” and “lunch bags,” whose folded-over leather recalls a brownbag lunch, is balanced by “earthy minimalism” and wabi-sabi, a worldview and aesthetic. The theme of the evening is “bringing the outdoors in,” as local flora commingles with the “strong bold colors” that inspire the designer. On the couple’s white marble dining table, Sophia Moreno-Bunge, founder of Isa Isa, a floral design studio based in Los Angeles, arranged fruit forward centerpieces of palms, pistachios, and dates, an earthy palette offset by bright blue cornflowers. Moreno-Bunge, who named her company after her Argentine grandmothers, takes inspiration from Argentina’s “effortless rustic elegance,” what she describes as its “Jurassic beauty,” and the pastel and ocean tones of her native Los Angeles. To signal the green occasion, the floral designer also created a custom pot-wreath studded with leaves and fresh limes, which hangs on the door to welcome guests, including Tyler Britt of Sterling Ruby Studio and Megan and Hunter Gray, a stylist and film producer. This mindset also guides the logic of MedMen’s cannabis pairings from local grower Northern Emeralds. The salad course comes with a joint of sativa-dominant Durban Poison, chosen in part for its flavor profile: pepper and star anise to complement the heady fruit as well as for its cerebral high to ignite conversation. The swordfish is served with the lemon-rosemary tasting notes of Titan OG, an indica-dominant joint, anticipating the body high that comes with dessert. And finally, the crémeux is accompanied by Kiva Confections’ handcrafted cannabis espresso dark chocolate, whose 1:1 THC to CBD ratio allows the guests to come down gently. Hansford, who describes herself as a longtime proponent of marijuana, particularly enjoys the curatorial nature of Los Angeles post-legalization, where “you can really choose what you want for your body.” Describing her Saturday routine as a trip “around the corner” to MedMen followed by a stop at natural-foods mecca Erewhon for fresh elixirs and Gjusta for baked goods, the designer appreciates “the ability to talk to someone that is educated, and actually, buy a product that is really suited for what you need.” In an evening infused with four different cannabis products, guests were encouraged to microdose, to go at their own pace and to listen to their bodies. It’s a philosophy perfectly suited to Hansford’s signature wabi-sabi yet free-spirited aesthetic, and one we’re looking forward to conjuring for your next infused dinner party. “I don’t necessarily like things that match, except for luggage,” says prop stylist Gena Sigala, who got her start at Neiman Marcus. “Knowing that there are no rules, being comfortable with what speaks to you, I think that’s key.” On the table, napkins appeared in different formations across the stoneware, creating informal and sculptural variation. From locally sourced swordfish to locally grown cannabis, the evening’s ingredients showcased the best of California. To take a local note even further, think beyond the menu. “In an era of being more environmentally aware of things, and how we live,” says Segala, “Thinking locally becomes even more vital.” To wit, she sourced hand-thrown bowls and hand-dyed textiles made in California. For cannabis pairings, try starting with an aperitif glass of CBD spritzer, followed by a sativa-dominant strain to inspire conversation, then switch to an indica for the main course, and cap the night with a nibble of canna-chocolate, all in microdosed amounts.